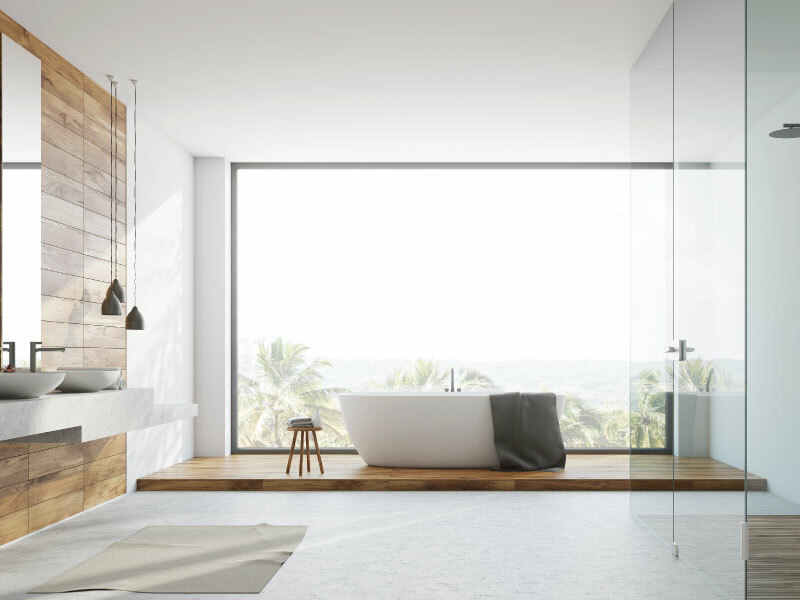 In a style where less is more, contemporary bathrooms create a harmonious flow with open plan living, smooth design profiles, solid or softly patterned materials, minimal accessories and an abundance of natural light. 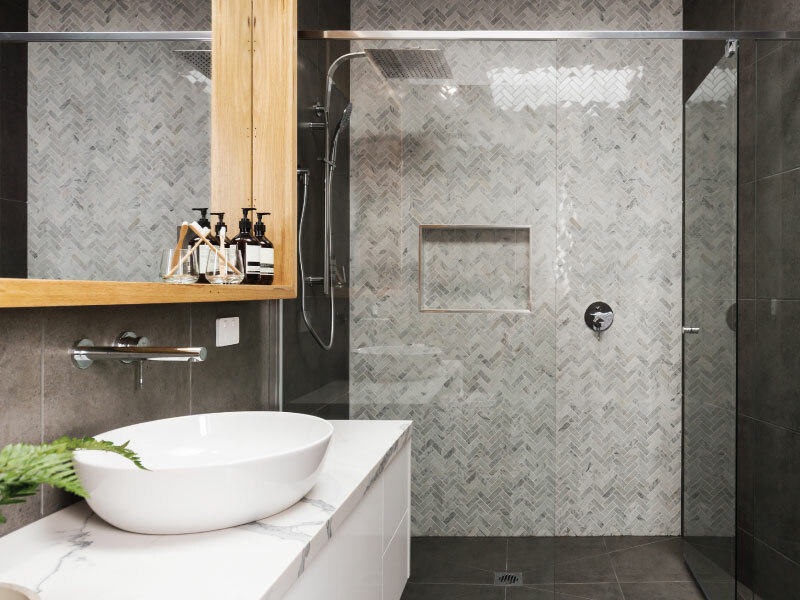 Although they may not be as warm as traditional bathroom renovation designs, the natural light and subtle textures and tones welcome you in. It’s also important to remember that contemporary and modern decorating styles aren’t the same thing. Although they are similar, modern refers to a 20th century design movement, whereas contemporary is more fluid and as such, an ideal style to break some decorating rules. 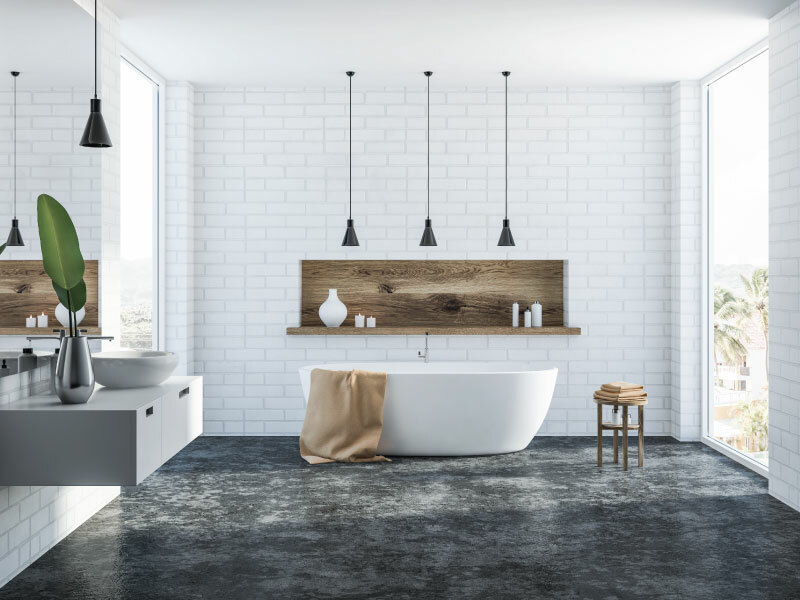 So, when it comes to contemporary bathroom renovation design, there are six key elements: colour, bath, shower, vanity, light, fixtures and fittings. 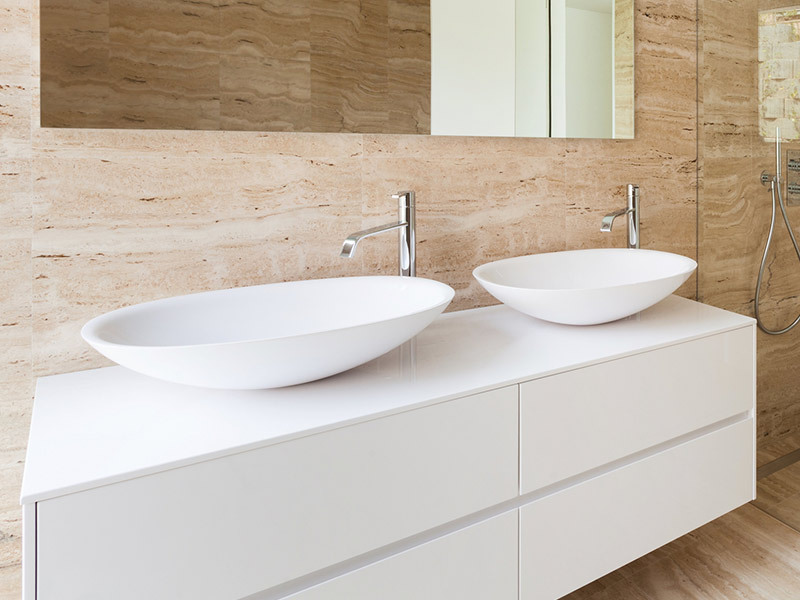 When designing your contemporary bathroom, stick to a neutral colour palette of three. We recommend using white as your base, with the other colours being influenced by the materials you select, such as timber, stone and metallics. If space allows, the hero of your contemporary bathroom design should be a freestanding oval bath. White, black, stone and metallic finishes are the most popular, and for an extra design statement, look to those with raised ends. A frameless or semi-frameless shower teamed with a fixed waterfall square shower head is a match made in heaven for contemporary bathrooms. 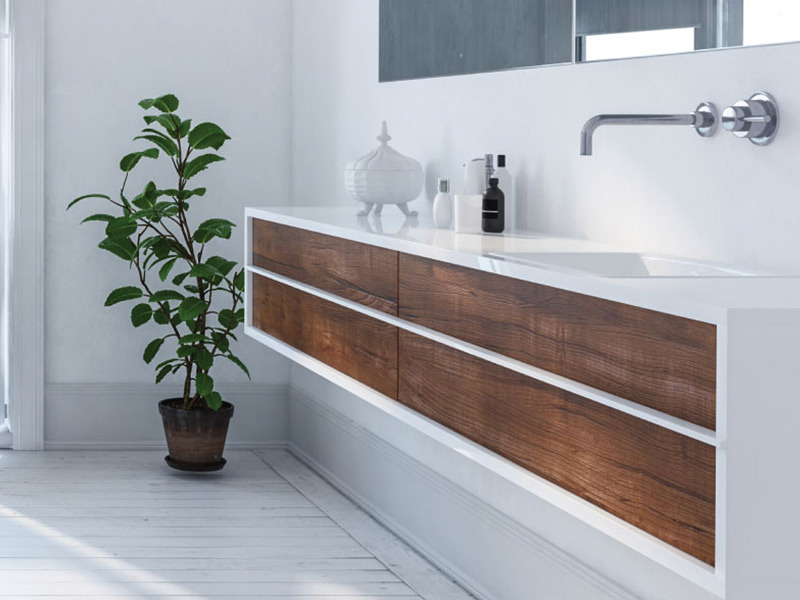 Wall mounted minimalistic designed vanities, that allow one material, texture or pattern to shine, such as a marble benchtop, is key for a contemporary styled bathroom. When creating a contemporary bathroom, start first with natural light. If this is currently poor, then ensure your renovation design maximises this element, through windows and/or skylights. Given the high reliance on natural light, your contemporary bathroom renovation design also needs to seamlessly incorporate downlights (for background lighting), while also considering task lighting (above mirrors) and accent lighting (to highlight any feature areas within your space). Sleekly designed feature pedants over the vanity, bath, or both, is also a signature of contemporary styled bathrooms. Smooth design profiles in chrome and black will remain timeless in a contemporary designed bathroom. However, if metallics like bronze or copper are featured in other elements of your bathroom (such as your bath or tile pattern), then it’s always best to match these to your fixtures and fittings in order to ensure your bathroom maintains its minimalistic edge that contemporary decorating is all about. At MW Homes, our team will discuss your contemporary decorating and design preferences with you, in addition to providing some new ideas based on our extensive renovation experience. We’ll then work together to finalise and create the perfect contemporary bathroom for your lifestyle. For more information on the six key bathroom renovating elements: colour, bath, shower, vanity, light, fixtures and fittings, read our Bathroom Renovating 101 Guide. For inspiration and ideas take a look at our Bathroom Renovation Gallery.